In the spring of 2018, Sophiah Rodriguez was worried about her health. She was in search of something that could change the way she felt. “My health was not where I wanted it to be,” said the Harlingen native, born-and-raised. She then settled on trying a ketogenic diet, which seeks to dramatically lower carbohydrates by eliminating grains, rice, beans, potatoes, sweets, milk and fruit. The keto diet lowers insulin levels while increasing fat burning, leading to weight loss. Rodriguez was a believer after one month on keto. She lost 20 pounds. 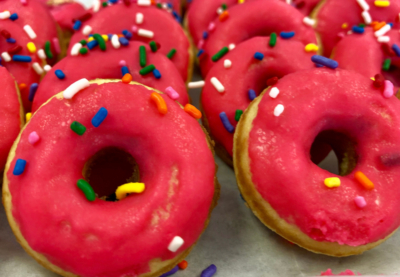 That question and subsequent baking experiments to perfect a keto donut that could equal the taste of a sugary glazed donut would lead to Keto Mini Donuts, a way to “treat yourself guiltlessly,” with sugar free, gluten free, low carb and diabetic-friendly donuts, as Rodriguez’s business cards tout. On July 21, 2018, Rodriguez with the help of her husband, Miguel, opened Keto Mini Donuts on Rangerville Road and immediately adjacent to Expressway 83. On that first morning of being in business, she sold out of donuts in two hours. Less than a year later, the steady stream of customers on a recent rush-hour morning shows the Keto mini donut phenomenon is still going strong. 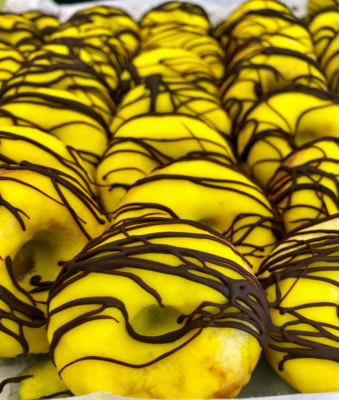 In the display window, the colorful minis in yellows and reds, along with the browns of chocolates and sprinkles with nuts and coconut, beckon customers. “They’re small, cute and full of flavor,” Rodriguez said of her creations. Next to the little and mighty donuts are an array of cookies, which are also true to the keto way of being low carb, and sugar and gluten-free. Nearly every day of the week, except for Sunday, “my one day of rest,” she said, Rodriguez is up at 2 a.m. baking at her Harlingen kitchen. Her products sell not only locally, but also in points throughout Texas and the nation via shipments. 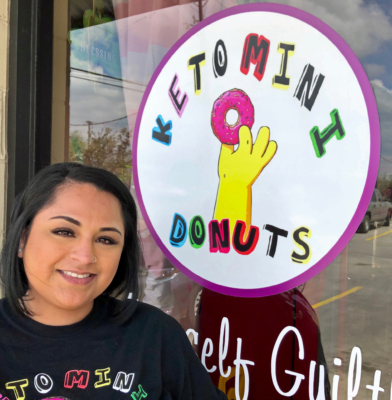 “Sometimes I take a second and think, ‘is this really happening?’” Rodriguez said of the whirlwind that has taken her from wondering if a good keto donut could be made to plans to have three Valley locations by year’s end, with new stores in Brownsville and McAllen. The belief that keto “is not a diet but a lifestyle” is at the heart of her passion. It can dramatically improve the lives of those needing to lose weight while also controlling their sugars. Rodriguez holds herself up as an example. She has a hard-working lifestyle of running, owning and operating a business, for now, with little sleep. “It’s keto that keeps me energized,” she said. 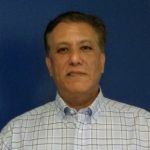 Rodriguez has ambitious plans to open stores in larger Texas markets, especially the Houston area. She is using her hometown as a base, with the little shop on Rangerville Road as where it all started.